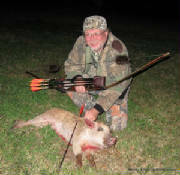 Here is Pat Byrne with another Texas Pig he took with an Abowyer wapiti and his ACS longbow. This pig went a very short distance before quickly expiring. Congratulations on yet another successful hunt Pat. Pat Byrne with a Texas pig that was taken with a 45# @28" ACS longbow. He was using Beman Realtree Axis 500 arrows with Abowyer wapitis.